This article originally appeared in the summer 2018 issue of The Twig, our 24-page member newsletter. To read more from this issue, click here. To become a member and receive The Twig in the mail, become a member. More than 20 volunteers showed up to help us clean up trash and debris at Tangeman Woods in Bartholomew County. We’re gearing up for a busy spring season, and this means a full plate of stewardship activities – especially on our 16 public nature preserves. And we need your help! As visitation at the preserves increases with the warmer temperatures, it’s important to make sure our trails are in top shape. Severe weather in this stormy season drops trees and limbs on trails, and flooding can damage infrastructure or bring in trash and debris. Anyone with trail maintenance experience might want to join a new group of volunteers, the Sycamore Trail Rangers. The Rangers will assist with general trail maintenance, as well as clearing trails that may be obstructed by downed trees. Another one of the big tasks of spring and summer is invasive species monitoring and control. Frequently, invasive plants are among the first to leaf out, and this makes spring the perfect time to control them without harming the native plants. To treat invasive plants, we determine the method that is least harmful to the surrounding environment that will still hinder the invasive plant’s ability to grow and reproduce. Sycamore relies a lot on our amazing volunteers to help protect and maintain thousands of acres and 35 miles of trails. Already in 2018, volunteers have contributed more than 100 hours to help control invasive species, pick up trash, and assist with trail maintenance. These volunteers are willing to work in all weather conditions and do what is needed to help Sycamore protect the land. If you’re interested in general volunteering, look for an upcoming Preserve-a-Preserve Day, usually on the third Thursday of each month. We’re also looking for individuals interested in Adopting a Preserve. 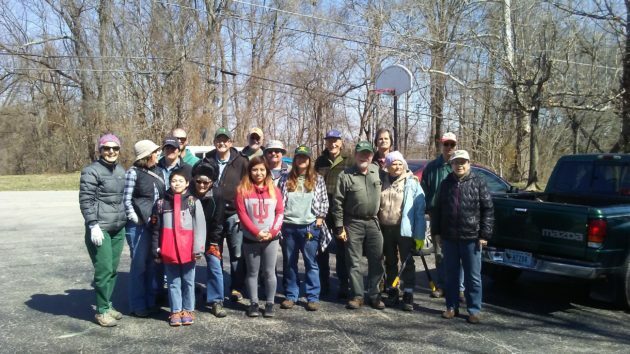 Our goal is to have at least one or more volunteer stewards for each Sycamore preserve. Stewards agree to monitor their preserve throughout the year and to report any issues or concerns. Please get in touch with me at chris@sycamorelandtrust.org or 812-336-5382 extension 103 if you’re interested in helping. Thank you to all those who have volunteered their time with Sycamore!